V.i. The Gravedigger Scene - Alas, Poor Yorick! 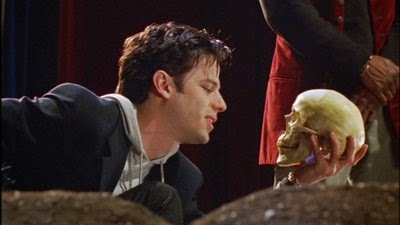 There's a bit in Slings & Arrows in which Oliver, the director's dead mentor/antagonist/haunter has asked for his skull to be part of the production, but this detail is forgotten until the last minute, so Geoffrey is forced to run to his office, where he keeps the skull as a mint dispenser, during the Gravedigger Scene to get it. It's black comedy, just as the scene on stage is. Most the scene is heard on the P.A. system, and we rejoin the world of the stage just as Oliver's skull makes it to the grave. In the staging of the play inside the show, it's lucky that Yorick's skull doesn't make an appearance until Hamlet picks it up. It stays in the pit until needed. Would this have an effect on the play? In such a version, Ophelia might have lain next to Yorick, her open grave a symbolic doorway to Hell, an infinite space that can contain multitudes. As Hamlet picks it up, we see there are still mints clenched in its jaw. The shot occurs on the line "excellent fancy", which is perfect. The real world of the actors performing the play, as ever, informs the play itself in Slings & Arrows. In this case, Hamlet is played by Jack Crew, a Hollywood movie star cast by Olivier, dead director turned hack. When Jack holds Oliver's skull in his hands, he holds that of a surrogate father, just like Hamlet does, one he barely knows. He takes his true direction from Geoffrey, a former Hamlet, and so, for Jack, the Ghost of Hamlet Sr. But Jack wouldn't be there without Oliver, tapping into the questions of paternity that animate the play itself.